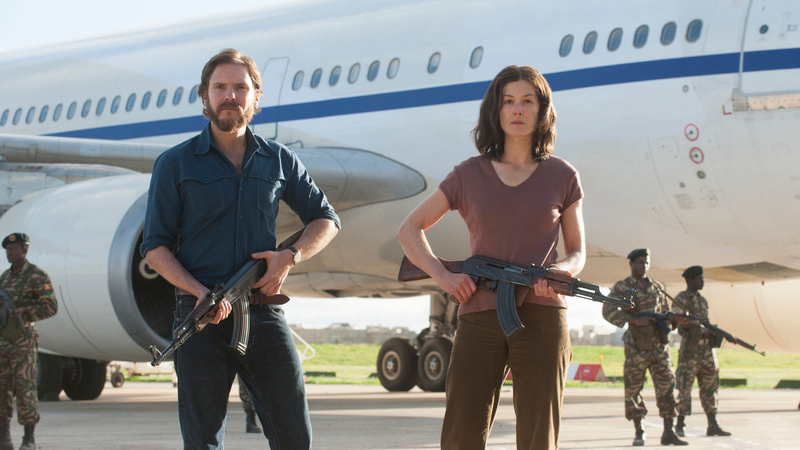 A tense thriller inspired by true events, Entebbe explores one of the most daring hostage rescue missions ever attempted, and by combining vivid historical details with suspense, it is a powerful depiction of an international crisis that shook the world. Set in the summer of 1976, an Air France jet travelling from Tel Aviv to Paris is hijacked in midair by two Popular Front for the Liberation of Palestine activists and two members of the German Revolutionary Cells group. Their objective: use the capture of 84 Israeli passengers to force the Israeli government into negotiating with them over issues concerning the Palestinian people. With 250 passengers on board, the terrorists divert the plane to an abandoned terminal at Entebbe Airport in Uganda, and militarily supported by dictator Idi Amin, who was outspoken in his anti-Israeli views, the entire plane including all crew become hostages. For a week, the terrified passengers are bargaining chips in an international political standoff, held captive under 24-hour armed guard. The hijackers demand $5m and the release of more than 50 pro-Palestinian militants imprisoned around the globe; with the world watching, it looks like Israel has no choice but to negotiate with the terrorists in order to save lives. But behind the scenes, a covert military solution is being drawn up, and as the likelihood of finding a diplomatic solution fades, the Israeli government sets in motion an extraordinary plan to free the prisoners before time runs out. This rescue became known as Operation Entebbe, also known as Operation Thunderbolt. Ultimately, this a story about conflict and tension. Germans Brigitte Kuhlmann (Rosamund Pike) and Wilfried Böse (Daniel Brühl) argue with the Palestinian hijackers about who is in charge, and between themselves over how the hostages should be treated. The Prime Minister of Israel, Yitzhak Rabin (Lior Ashkenazi), argues with Defence Minister, Shimon Peres (Eddie Marsan) about trying for a peaceful solution, and a deep conflict between them becomes clear when Peres urges Rabin not to negotiate with the hijackers, and insists on a covert military solution instead. The conflict between the hijackers and the passengers is ever-present, but the moments of humanity shine through the standoff, and remind us that pain and loss often fuel fury. This duality at the heart of Entebbe is filled with contradictions. The larger conflict of Israel and Palestine is an elephant in a room filled with people who we’re not sure are heroes or villains. The notion of being heroic – which Kuhlmann and Böse feel sure they are doing, as do the Palestinians, as well as the Israeli soldiers on the raid – is contrasted with terror and possible death. With two parallel stories taking place, director José Padilha chooses to intercut the key moments of the film with an intense piece of dance by the Batsheva company. Created by Ohad Narahin, ‘Echad Mi Odea’ is a jarring, emotional work, which at times detracts from the drama. It’s a strange choice to place within a reenactment of real-life events, but later on, as the tension builds, it becomes an effective tool driving the pace, and alongside the soundtrack keeps the audience on the edge of their seats. The art direction, cinematography and costume design are superb. The set was built to match the original airport terminal in Uganda, and feels real, right down to the overcrowding, and grubby bathrooms with no running water. There was incredible detail in outfits, especially given a cast of this size. Even the yellowy-brown tones of the film stock and shaky handheld camera lend to the authenticity of the look, matching some archival footage of the time.